Now with 5 of the 23 Master Certified Machinery and Equipment Appraisers MCS can provide one of the best appraisals available in the US. Nationwide Appraiser Services in the United States and including Canadian Territories. Due to our National network of Appraisers we have the ability to easily perform Appraisal services in any of the United States or Canadian Territories. Our far reaching network also helps to increase the speed of appraisal completion and lowers the cost of our services by reducing travel costs. 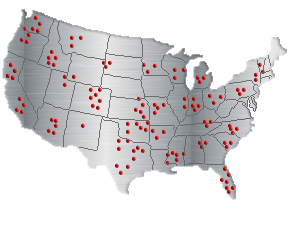 With our Headquarters in Wichita Kansas, and Satellite Offices in California, Texas, Indiana, Florida, we are ready to help you quickly with Local people. We also have direct relationships with over 400 Micro Offices that include Appraisers with almost every sort of specialized knowledge you may need.